Ok, I have a confession to make. I am a self-proclaimed gift card hoarder. I have a terrible habit of stashing gift cards that people have so generously given me and not spending them. I can just hear all you shoppers out there going, WHAT?! WHY? Case in point: I still have a couple of gift cards from our wedding to Bed, Bath and Beyond. How long ago was our wedding you might ask? Oh, three and a half years ago. I somehow got this idea in my head that I have to save gift cards for the perfect item. I fear that if I don't spend it on the right thing, that that money goes to waste. But why? Why do I feel this way? It's kind of a ridiculous thought. Gift cards are an incredibly wonderful gift, because the giver has given YOU the freedom to pick anything you want, which is pretty fantastic. That should be freeing, not fear-inducing. Does anyone else have this problem, or am I the only weirdo that holds onto gift cards for years at a time? So in the spirit of this series, I am using what I have...in the form of gift cards...to buy something I'll love. And I'm starting with a gift card I have to Paper Source. Being a sucker for all things paper-related, Paper Source is one of my favorite places to wander around. Yesterday I dropped by there on my way home, and besides oogling at and taking inspiration from all the gorgeous things they have, I used my gift card to purchase a 2014 planner. I'm a big fan of using a paper agenda for blog planning and brainstorming, so all-things-blog will fill these pages in 2014. 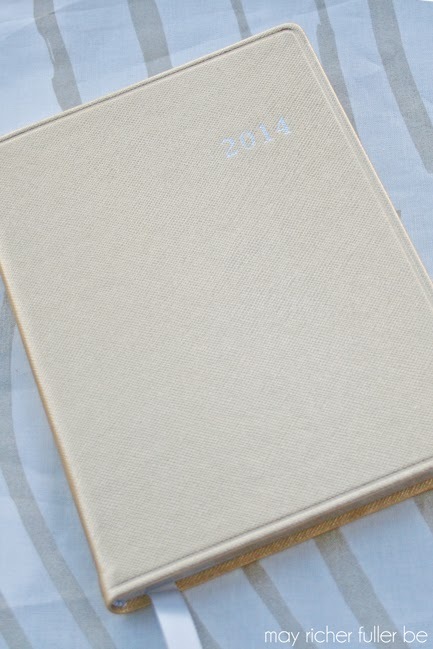 If you're interested in grabbing one for yourself, this is the 2014 Large Gold Date Book and it is purty. Not only am I a sucker for all things paper related, I'm a sucker for all things shiny. I figure if I'm going to be carrying this pretty lady around for a year, she might as well be easy on the eyes. The first pages contain monthly calendars, which I love, because I like to see the big picture of what's coming so I can plan ahead. 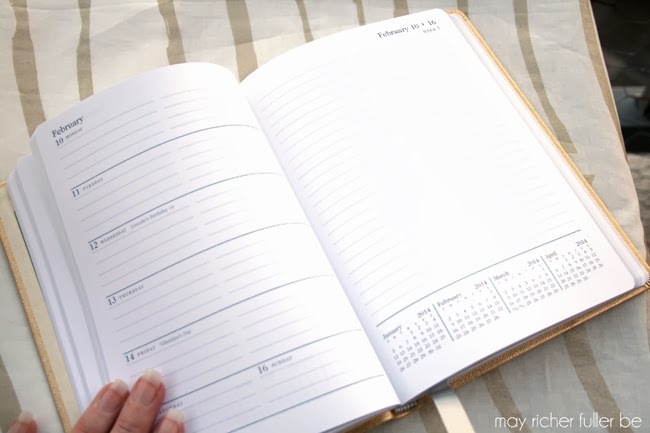 The next section contains weekly calendars with the days of that particular week on the left side and then a blank, lined page on the right. The blank, lined right side is really what sold me on this one. I'm a major, major list maker and I like for my lists to be in close proximity to corresponding plans for that week. Does that make sense? For example, if I'm planning to do a DIY post, I'll often have a checklist of items that I need to accomplish before I'm able to post about it on the blog - things like buy/round up materials, take photos of each step, edit photos, write the post... I don't always write out all the steps in my planner, but sometimes I find it helps keep me focused and on schedule. If I don't need to write up a to-do list for that week's post, then I can use the space for brainstorming. It might seem a little old school to use a paper planner when I've also got an iPhone, but this is what I've found works best for me so I'm rollin' with it. I do use my Google calendar for personal and work-related calendars, especially when collaborating with others. That's super handy. I'd say I made good use out of my gift card (thanks to my brother and sister-in-law for the gift! ), and I can't wait until the end of the year when I can start using it! Now I want to hear from y'all. 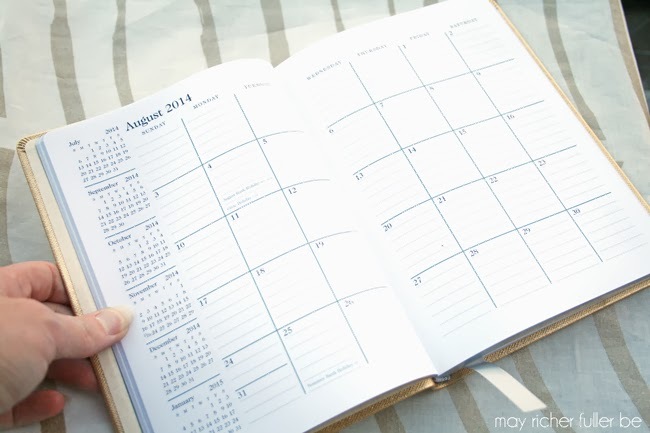 Are you on the paper agenda bandwagon? Technology all the way? A mix of both like me? I'm curious! Speaking of paper calendar-y items, tomorrow is the official launch of my 2014 desk calendar in my Etsy shop. Come back tomorrow for more details on that! I have a gift card hoarding problem, too! We are moving in a few weeks, and on my clean-out-everything mode, I came across them and am slowly spending them. I put them in my car, so I'll have them with me. (I change purses a lot.) I, too, have several BB&B gift cards. Our 2 year anniversary was last month, so I decided to spend them on sheets for our bed (it's "cotton" year.) The sheets are delicious, and consequently, $150. Yikes. So my hoarding (+ coupon) paid off! Hooray. So glad I'm not alone! And hooray for new sheets! I discovered a rip in one of our sheets as I was folding laundry last night, so that may be what I use my BB&B gift cards for too. Happy late anniversary! As far as paper vs technology I am gradually becoming exclusively a computer (or smart phone) gal. It helps that I can have everything synced together or get an email and just push a button and have it on my calendar. My latest conversion was the ziplist app which is for my grocery list, I LOVE IT. I still jot things down from time to time though. Enjoy your new planner! I totally agree with you on the syncing everything part! I love my smart phone for that very reason for my personal life stuff - but for some reason, the blog is a different animal for me and I'm loving planning things out on paper. Essentially, the more reports you can see, the better. Once you get used to what all the reports and data mean, you will be able to have a firmer grasp on how well certain aspects of your program are functioning.